Reports of first frosts trickle down to me from friends in New England. We're supposed to be safe in southwest Virginia until October 10, but I can feel the change of season pushing against our garden. 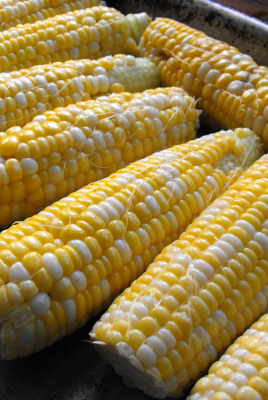 Tuesday, I scurried around freezing the year's last batch of corn along with some okra and broccoli. 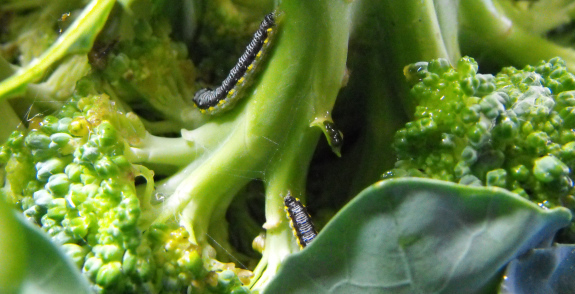 Cross-striped cabbage worms had crept in amid the broccoli florets while I ignored the garden last week, so I tried to soak the heads in salt water with little success, instead ending up just picking off the caterpillars. Still to be harvested this week are peas, swiss chard, green beans, basil, and summer squash (ate our first squash from the fall bed Monday!). We might even dig up our sweet potatoes since they need a warm curing period just like winter squash. Suddenly, other projects are also asserting their importance. That water line we nearly buried in the spring needs to be finished, our bathing and chicken waterer construction shed looks awfully important all of a sudden, and even the worm bin will require some care to bring it through the winter. Since we do our laundry in a wringer washer outdoors and dry the clothes on the line, now's a good time to hurry up and wash all of our bedding before cold weather makes drying comforters impossible. We'd also like to turn our broken fridge into a cheap root cellar, but that project may not make it onto this year's agenda. Fall sure is a busy season!